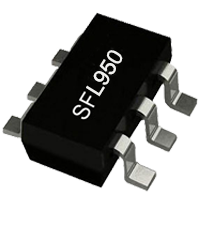 SFL950 is optimized for isolated Flyback topology LED constant current (CC) controller, with high PF value and low THD, is suitable for LED lighting area. The IC adopts proprietary "super-PFC/PSRTM" control and "min-THDTM" technology, makes efficiency up to 90%, PF value larger than 0.92, THD lower than 10% and ±4% CC accuracy for mass production. Built-in proprietary high precision closed-loop constant current control, SFL950 supports QR and DCM mode with input and output compensation increasing LED CC accuracy. Max frequency is clamped to 90KHz, resulting good EMI performance. SFL950 adopts QR control, turns GATE on at valley to decrease switch consumption, and the efficiency is increased. SFL950 integrates functions and protections of Under Voltage Lockout (UVLO), LED Open/Short Protection, VCC Over Voltage Protection (OVP), Load Over Voltage Protection (Load OVP), Soft Start, Cycle-by-cycle Current Limiting (OCP), Burst Mode Control @ Light Loading, GD Clamping, VCC Clamping, etc.